Our latest version of a roller sear takes today’s customer needs into account more than any other sear on the market. 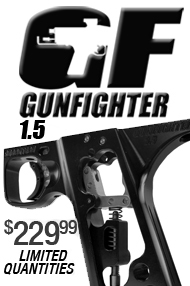 There are dozens of manufacturers that have made their own .45 frames, triggers, sears, hammers, lugs, even bodies, mixing and machining all these various components can sometimes lead to inferior results. Allowing excessive wear and improper geometry, even causing the sear to catch the hammer rather than the lug. To help rectify these and other potential problems, we are releasing a 7 position sear. 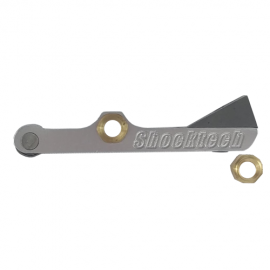 The Shocktech Roller Sear comes with two separate brass inserts for the roll pin to ride on. The first insert is to be used when you have all Shocktech components. It is set dead center and will match up as intended. The second brass insert can be rotated to rest in 6 different positions. With a very slight offset to the roll pin giving you the ability to move the sear up or down to . 07! Check out the demo video to see a visual explanation then get ready to set up your roller sear exactly how it works best for you.